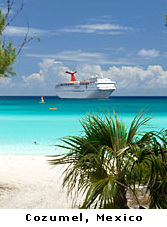 There is no better way to experience the Western Caribbean than on board the beautiful Carnival Valor! 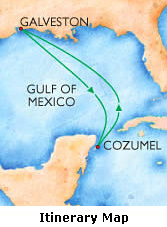 Visit Cozumel, Mexico with all your classmates from WHS's class of '77! *Rate is based on double occupancy. Inside rate is based on a category 4B. Ocean rate is based on a category 6B. Balcony rate is based on a category 8B. Rates are subject to change and are based on availability at the time of booking. Additional cabin categories may be available at the time of booking. A non-refundable deposit of $25 per person is required to reserve your stateroom. A second deposit of $125 per person is due by November 01, 2018. Final payment is due by January 04, 2019. 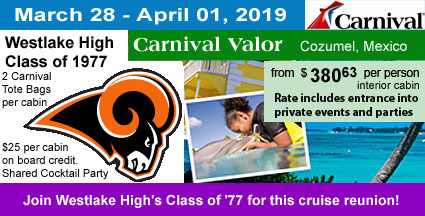 Triple, Quad, and Suite staterooms require the full $150 per person deposit at the time of booking due to limited availability.